Home › NAMA news › 2018 Convention in Victoria British Columbia was a riot! 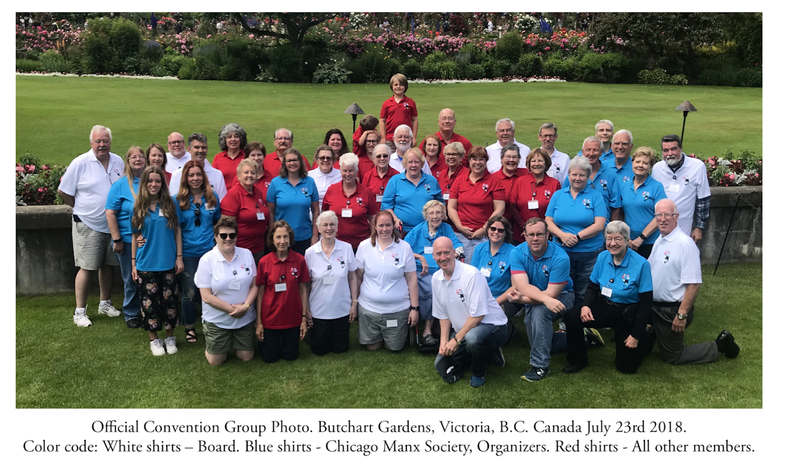 On behalf of Chicago Manx Society and the NAMA Board of Directors, I would like to thank everyone who made the trip to Victoria, donated time, or participated by purchasing souvenir-booklet space. While I might be slightly biased as the chairman of the convention, I believe the 2018 NAMA convention was a resounding success! I hope everyone will wear their convention polo shirts, featuring our convention logo, with great pride. I would like to thank our speakers as they were key to executing my theme of past, present and future. At our welcome reception, Florence Abbinanti (my grand- mother) via Brad Prendergast (my uncle) talked about our Chicago Manx Society history. My brother Tim and I posed with photos, including one of Florence as a child attending the very first Homecoming. Activities during the Convention were focused on the glorious outdoors of Victoria, British Columbia. On Friday, we had the opportunities to go on the water, either in a Zodiac (photo) or on a larger whale watching vessel. Many of us enjoyed the delights of Afternoon Tea at the Fairmont Empress. 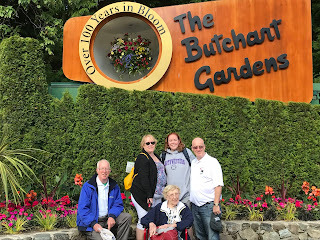 On Saturday we visited the world famous Butchart Gardens and shared a delightful (and huge) picnic on the Residence Lawn where we also took our group convention photo (above). Recent conventions have hosted classes in Manc culture. This year, Bill Cassidy presented a wonder- ful session designed to let us learn some basic Manx phrases. This will be an ongoing mission of his and the first written class is included in this newsletter. Margie Martinson spoke about Manx fairy tales that meant something to her. The NAMA motto is “What- ever is left to us of our ancient heritage,” and it is our ambition to foster more Manx culture, here in the USA through our meetings and publications. In his talk, David Holmes, the now 3rd Vice President, joked that he didn’t think he was qualified as he is not 100% Manx. The irony is that I, your new president, am in fact 100% American. Both sets of my grandpar- ents, my parents, my brother and I were all born in The United States of America. However, as an American, I concede that we all love to claim our desirable heritage, as such I am 25% Manx! During my speech thanking everyone for supporting my NAMA presidency, I addressed what is NAMA’s future. I asked more questions than I had answers to, because in the end we need you. The first big question was, who do we consider “young people” and how can we be more involved in NAMA and preserving our heritage. I am 35-years old and currently the youngest NAMA presi- dent in NAMA history. At present it looks that it will stay that way for the foreseeable future. So when we are talking about getting “young people engaged”, we as a group, not just the board, need to seriously consider what we mean for “young people”. Do we mean me, or do we want to engage in people straight out of college in their 20s? How can we help the “young” people engage with NAMA, to feel the love of this organization? The second question is how do we get our current members more involved, assuming you want to be? Each of you who have received this newsletter, what can you do to help preserve our heritage? Can you tell us about a meeting or a story or a group where you have gotten to share something about our lovely country? If you have, we urge you to tell us about it. We print stories in this bulletin that often don’t feature our members, not because we don’t love and appreciate each; it’s simply because we don’t hear of your amazing- ness. If each of the 400+ members, sent in one story to our bulletin editor over the next two years, think of how much more we will learn about each other and our lives before we meet again 2020! We love getting emails that your kids or grandkids have made Eagle Scout, or got a scholarship to Harvard or Kenwood Cooking College, finished a carpenter’s apprenticeship. We invite you to get involved and share the amazing things in your world. May I wish each and every one of you a wonderful rest of summer, and again, thank you from the bottom of my heart for your love and support of me and the 2018 convention. None of this, and I do mean none of this, is possible without each and every one of you. Three generations of Manx Prendergasts!